I have been waiting patiently for James Strachan to write a blog to introduce us to his latest project - hawtio. This project surely has the potential to become as great or even greater than Apache Camel. hawtio is a lightweight and modular HTML5 web console for managing your Java stuff. Today James is busy doing the release of the hawtio 1.1. This is a very hawt release, that has great functionality already, so we should start spread the word about this project. We have also talked about doing small videos, as recoding what you do in a web browser is easy. Anyway this blog entry today of mine, is not to steal the thunder from James. I would let him do the introduction of hawtio, and his vision for creating this project. So in hawtio we have a Camel plugin, that allows you to gain insight into your running Camel applications. 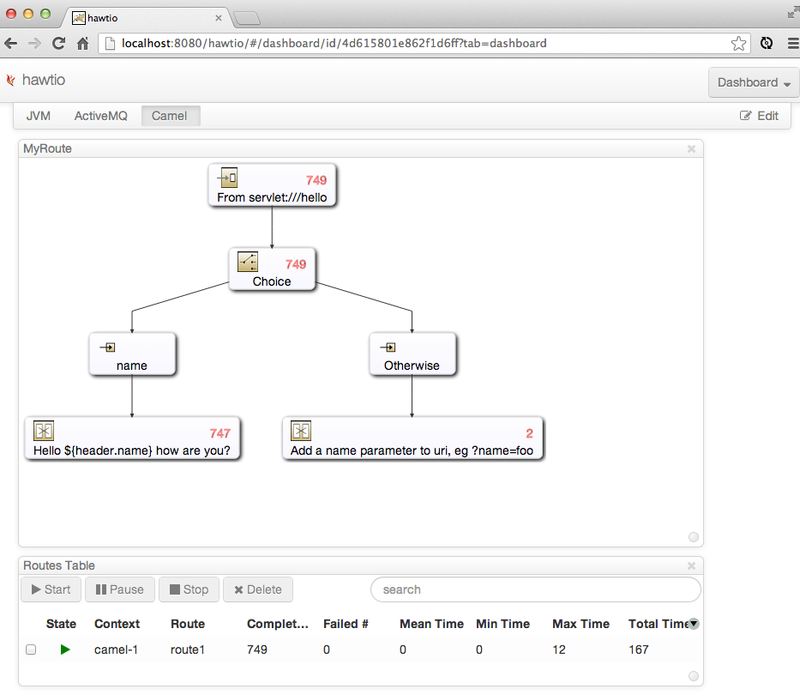 So the screenshot below is from hawtio running as a plain web application deployed to JBoss AS 7.1.1. You can use any web container of choice, such as Tomcat, Jetty etc. Though I was tasked to give the JBoss AS a little test spin, and thus had the opportunity to take a screenshot. I have also deployed the Apache Camel example camel-example-servlet-tomcat in the container (its also just a WAR application). 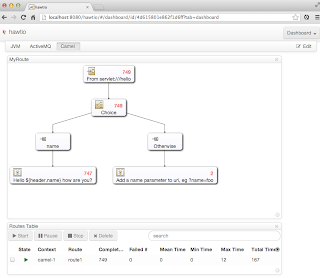 Dashboard in hawtio, with a live Camel diagram and table, updating in real time. hawtio allows you to create custom dashboards, where you can add any part of a view to the dashboard, and position the views as you please. So I created a Camel dashboard, which has a live diagram of the route from the camel-example-servlet-tomcat. As well a table with the running routes and their state and some key metrics. All the data on the dashboard updates in real time, which is very cool. And the dashboards can be saved to a git repository, and you can share them with your team. And as its just a URL you can easily access the dashboard, by just copying the url from the browser address bar. Anyway hawtio has a lot more cool stuff already. And we are having fun hacking on it. Its of course a 100% open source project, ASL licensed, and hosted at github. Everybody is welcome to contribute and hack on it. Stay tuned, more blogs and videos should be coming in the future.